This feature is not available if you have a Starter Plan. Learn More. To set up a scheduled email snapshot for a Klip or dashboard that contains variables, you must provide the value of the variable you want to display, otherwise when you send the email snapshot it will contain a blank Klip or dashboard. To learn more, see How to build User Input Control components (+video). Select the Klip or dashboard that you want to schedule as an email snapshot. In the top-right corner of the Klip or dashboard, click the Menu icon. Select Share > Email Klip or Share > Email Dashboard. Note: If you want to use the Include "All" data option, the current value for this variable is _all_. Navigate to the Klip with User Input Controls that you want to schedule as an email snapshot. In the top-right corner of the Klip, click the Menu icon. In the Component Tree, under User Input Control, select Values. On the Data Panel, click the Evaluate icon to see the Current Values for each row in your drop-down list. From the Evaluation Results list, highlight a value and copy it. Navigate back to your first Klipfolio tab. Under Current Value, paste the Current Value into the text box. Complete the Scheduled Email Snapshot setup process. 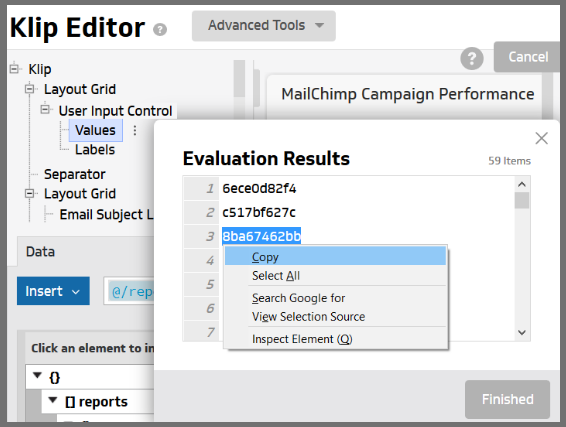 You can now send a scheduled email snapshot of a Klip or dashboard that contains variables.